Click the buttons on the right to learn more about EDDIE AYALA! To provide outstanding, professional entertainment at your event. Eddie posseses several years of successful mobile and nightclub DJ work and is a well-versed master of music. Having provided entertainment for dances, formals, corporate events, and wedding receptions, Eddie has vast experience in every sort of event and can expertly assist you in your entertainment planning process. 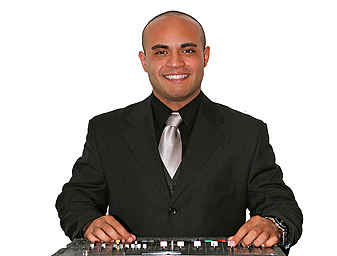 No matter what your specific preferences might be, Silver Sound DJ Eddie Ayala has the ability to meet and exceed your vision for the celebration of your wedding day. Whether you are looking for a laid-back and conservative approach from your entertainer, or are more interested in an active and animated MC, Eddie has the maturity to execute the style you need for your day. Able to judge the situation accurately in order to be prepared to please the crowd, trained over the years learning from the experiences the different techniques needed to please different generations. Great at mixing music, always playing nothing but hits, and music that makes the party dance. Able to scratch, mix, and use sound effects while mixing in order to amplify the excitement at the party. Eddie's music tastes are worldwide. His knowledge of music extends across Motown, Top 40, Hip-Hop, R&B, Reggae, Reggaeton, Salsa, Merengue, Bachata, Modern and Classic Rock, and Country. One of the hardest parts of becoming a member of the Silver Sound DJ staff is being compared with the other Silver Sound DJs. It takes some time to build up a nice portfolio of photos and 100% Customer Reviews. Customers experience non-stop dance floor action, hard hitting sounds and musical talent. For younger audiences and parties, Eddie is known to wow crowds with interactive activities and the best mix of music and a night all will remember. Click here to request a quote for Eddie's services! Click here to email Eddie with any questions!